For as long as I can remember my dessert making passion, I had a thing for chocolate. I find it to be the most versatile and delicious pastry ingredient and the one that allows me to get creative, one that you can never go wrong with. From brownies to a scrumptious birthday cake or entremet, I love them all and I believe that this blog has plenty of recipes involving chocolate (don’t worry, more to come as well). My favorite chocolate is the dark one (at least 60% cocoa powder), but the kind that has a mild flavor and not the bitter, dense kind. As pastry chef, I simply love the depth of flavor and richness that chocolate add to desserts. So I decided to write this article to help you understand chocolate better and find out everything you need to know about chocolate. Chocolate has been around for quite some time now but how many of you know the real history of chocolate?! Originally consumed by the Aztecs as a bitter drink that was believed to have healing properties, chocolate had a long journey to become the bar we know and love so much today. Initially, chocolate was considered the food of the Gods and was consumed only by the privileged people of the society, such as kings or priests. The Spanish were the ones to bring chocolate from South America to Europe. The bitter drink was improved by Europeans with the addition of sugar and honey and as time passed by, more and more additions were made. Even so, chocolate was only available to the rich people who could afford it. It was only when people like Rodolphe Lindt or Henri Nestle came up with their own recipes that chocolate became available to everyone, rich or poor. So nowadays you don’t have to be an Aztec God or be rich to enjoy a bar of good quality chocolate! 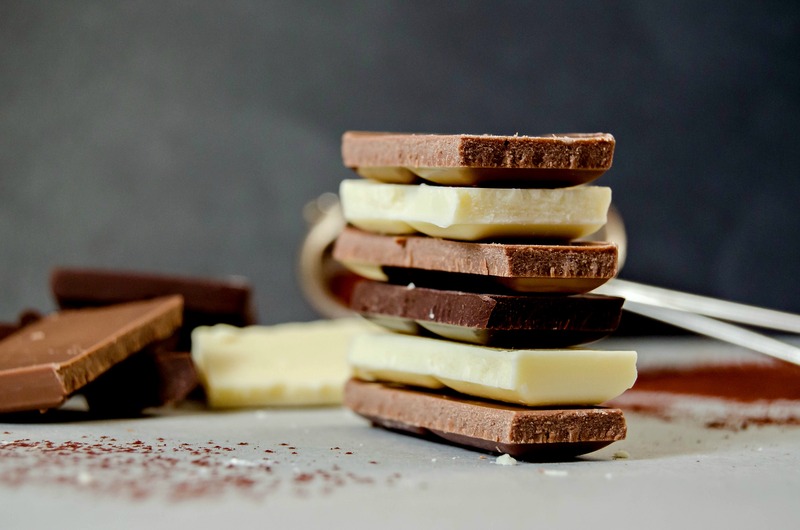 Regardless of recipe and its creator, every chocolate bar out there is made with using some basic ingredients: chocolate liquor, cocoa solids, cocoa butter, milk solids, sugar, lecithin and various flavorings or filling. What sets a certain type of chocolate apart from the rest is the ratio of these ingredients because the process of making chocolate is always the same. Adding more milk solids makes the chocolate creamier, adding more sugar makes it sweeter or the opposite: less sugar makes it bitter and closer to its natural state, less milk makes it harder to melt and not as creamy. Every ingredient has a well-established role in this whole process, but it takes more than good ingredients to make a great chocolate. 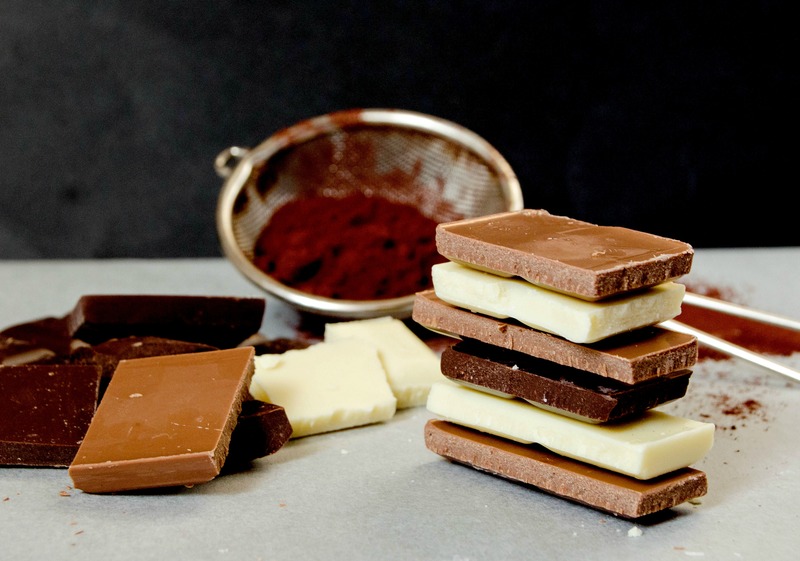 It takes a skillful chocolatier to put them all together into a recipe that works every single time, into a chocolate bar that tastes great and satisfies even the pickiest customer. Chocolate liquor is the first step of transforming the cacao beans into chocolate. This liquor is obtained after the fermentation and grinding of cocoa beans and it resembles a paste that has an intense bitter taste. This paste is usually half cocoa solids and half cocoa butter and often this paste is poured into molds to harden and form unsweetened chocolate. The chocolate liquor is processed furthermore into cocoa solids and cocoa butter. At first this may seem pointless as these two ingredients are still needed later on, but remember that it’s all about the ratio used in every chocolate recipe. Without processing the chocolate liquor into these two compounds, the recipe wouldn’t be as customizable as it is. The cocoa solids are particles of fibers, protein and starch and the cocoa butter is a fat like any other, except that it has some amazing health benefits. This compound is the most expensive part of the chocolate because it is needed not only to make chocolate, but also to make body lotions and face creams. It is the cocoa butter that impacts the texture, shape and melting properties of chocolate. The cocoa butter adds quality to the chocolate and you can easily spot chocolate that has been made with other type of fats by watching the white, un-glossy finish and the lack of a snap when it breaks. Although available on the market, unsweetened chocolate is not everyone’s favorite, that’s for sure. It is quite bitter and not as fun to eat so sugar is added to make it more pleasant to the taste buds. Milk and white chocolate have the highest amount of sugar. However, dark chocolate is great in baking and has a better texture after baking than sweetened chocolate. Milk solids, specifically milk powder, mellow down the taste of chocolate and add creaminess. 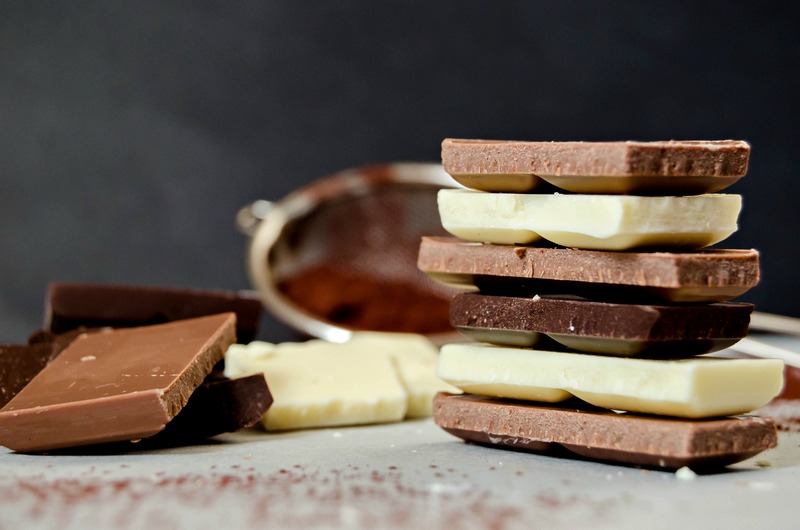 Milk solids are compulsory for white chocolate and milk chocolate and these types of chocolate not only taste sweeter, but are also softer and have a less snappy texture, they melt easier and are harder to work with when it comes to baking and tempering. The taste is milder as well since it has less cocoa liquor. This makes replacing dark chocolate with mild chocolate in recipes a little more trickier than you might think. Milk chocolate burns easier and has a lighter color, a different texture and it is sweeter. All that needs to be taken into consideration when using it in baking. Most chocolate bars have lecithin written on the ingredient list. This surely sounds weird for someone not informed enough to know what its role is. Lecithin is an emulsifier that reduces the viscosity of chocolate when melted. Without lecithin, chocolate would be hard to spread or temper, glazing would be difficult and creating decorations would be troublesome. Flavorings and fillings are often used to create amazing chocolate bars. How sad the world would be without chili chocolate or without caramel filled chocolate bars! When it comes to flavorings and fillings, the sky is the limit since chocolate is a match for most spices: vanilla, cinnamon, star anise, cardamom, Tonka beans and the list can go on. 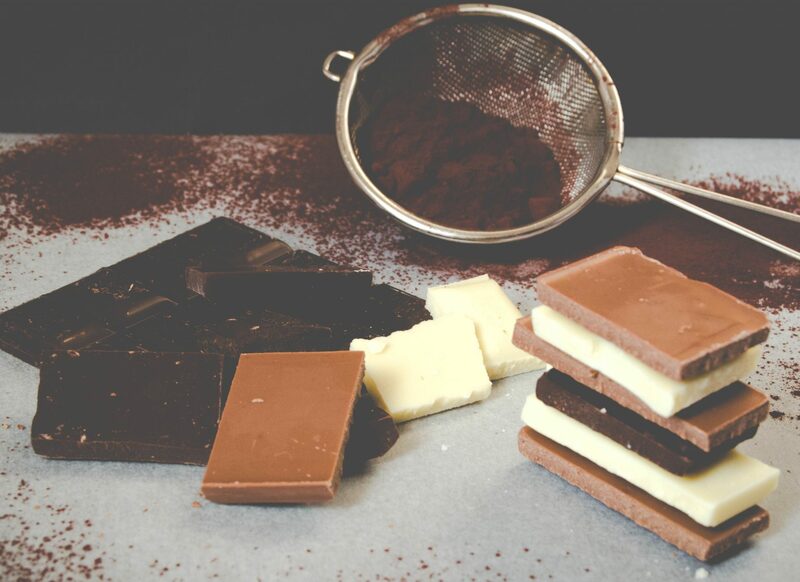 As for fillings, I’ve seen some weird combinations out there so feel free to experiment for yourself and use your favorite ingredients to create delicious truffles or chocolate bars! Cocoa beans, often referred to as cacao beans as well, come in many varieties, but the most known ones are: Forastero, Criollo and Trinitario. Forastero are the most common type of beans as they are widely spread and cheaper than the rest of the beans. The tree itself is originated on the Amazon and it is very resilient to diseases so it has spread all over the world. The downside would be the astringent taste of the beans which can be mellowed down only by a longer fermentation process. So in the end the tree is easy to grow and harvest, but the beans go through a longer curing process before becoming chocolate – everything comes with ups and downs I guess! Criollo was the tree brought by Spanish to Europe and it yields even today the world’s best quality chocolate due to its mild taste and acidity. Its amazing taste however comes with a downside. The tree is not as resilient to diseases as other types and it yields less cocoa pods as well. The result is a more expensive chocolate. Nowadays Criollo trees are grown in very few parts of the world and mostly in South America which has a better weather for such a sensitive tree. Trinitario is a hybrid between the resilience of the Forastero and the mild taste of Criollo. However, it doesn’t have the good quality of Criollo and it tastes rather earthy. Most good quality chocolates on the market nowadays are made using this type of bean, but don’t be fooled – using a certain type of bean doesn’t necessarily yield a good chocolate. The other ingredients and various other factors impact the final taste of chocolate as well. The percentage of cocoa in a chocolate bar tells you how much of that bar comes from cocoa beans. 60% cocoa means that the chocolate has 60% cocoa liquor and 40% milk solids, sugar and other ingredients, such as lecithin or other brand-distinctive ingredients. This information is enough to get a quick review of the chocolate, but in the end you need to taste different brands and find one you like because what that 60% doesn’t tell you it’s how much cocoa solids and how much cocoa butter the recipe has. These two impact the taste quite a lot considering that a chocolate that has more cocoa solids is darker and bitter while a chocolate with more cocoa butter is smoother, creamier and has a milder taste. Keep in mind that when buying a chocolate bar! No doubt that many of you love baking with chocolate, but have you ever thought what chocolate actually does to your baked goods, how chocolate impacts those brownies or that chocolate mousse?! The first noticeable thing is the taste – that’s what we all look and crave for! The chocolate taste is addictive! Depending on the beans used and the ratio of other ingredients, some chocolate bars are more bitter and acidic, others are slightly sweeter and earthy, others are milder and fruity. It’s a matter of trying yourself different brands and finding one that suits your taste perfectly. But apart from taste, chocolate adds texture to a dessert, especially if you use a high fat chocolate. That chocolate mousse will definitely taste better if you use a darker chocolate with a higher fat content. Keep in mind that some professional chocolate producers provide information like the fat and sugar content as well and that is extremely helpful when creating new recipes. Chocolate provides structure to your baked goods due to its fat content. Most recipes using chocolate take that into considerations. If you were to compare a recipe using chocolate with the same baked good made following a recipe using cocoa powder you would notice how the recipe using chocolate has less fat, but more solids and the recipe using cocoa powder has more fat, but less solids, cocoa powder acting like flour. In the end, each recipe is a way of balancing ingredients to get the result you are after. There are so many brands of chocolate out there that is hard to tell which one is good and which one it’s not without having a good look at each. Good quality chocolate shines and has a great snap when broke into pieces, it has an intense taste and melts in your mouth perfectly. Bad chocolate can easily be recognized by the white or grey streaks, also known as chocolate bloom. This bloom is caused by crystalized sugar that comes to the surface when exposed to humidity or in touch with liquids. This chocolate melts into a grainy mass and can hardly be used to create good quality products. There is also what we call fat bloom, which happens when stored in an unappropriate temperature, but this chocolate won’t melt properly either and it is best to use it in batters rather than in creams, mousses or decorations. Other low quality chocolates are soft to touch and don’t break with a snap. These chocolate bars are often made with vegetable fats like coconut oil or palm oil and it impacts their taste, texture and shine. They will never melt perfectly or taste nicely nor they will come together into delicious desserts. Mind you, they’re not even real chocolate so avoid them as much as possible. I prefer less quantity and more quality! Chocolate in its purest form has various health benefits that shouldn’t be neglected. Aztecs didn’t use it as cure for diseases in vain after all! Many studies conducted in recent years have shown that chocolate is a complex substance and its compounds have many health benefits. Flavonoids – these are strong antioxidants and reduce the risk of heart disease and the level of cholesterol. However, although they are present in all chocolates, it’s only the dark type (over 70% cocoa) that has them in enough quantity to make it count. Stearic acid – this is the main fat found in chocolate and has been proven to not increase cholesterol. The remaining fat comes in the form of oleic acid which doesn’t threaten the cholesterol levels either. Theobromine – this is a stimulant similar to the one found in coffee, but it’s not as strong. It has a bitter taste, hence the bitter flavor of cocoa and dark chocolate. Caffeine is also found in chocolate, but in very small quantities, so small that it doesn’t have any effects whatsoever. Tryptophan – is a compound which helps your body to make serotonin. Serotonin is responsible for your elevated mood, although researchers haven’t quite established how much chocolate influences the mood or if it’s a chemical thing or it simply acts like a placebo. Apart from these compounds, chocolate is also knows to have aphrodisiac effects, especially combined with ingredients like strawberries or chili peppers. Chocolate comes in so many varieties! Each producer has a different recipe and each variety has a different taste or characteristics. Preferences in chocolate are extremely personal. My recommendation would be to taste and experiment for yourself different brands and producers and find the one that balances the ingredients and fits your taste and needs. Semisweet – this type of chocolate usually has 50-60% cocoa content. Its taste is milder and it can easily be used in cakes, mousses, creams etc. Bittersweet – often referred to as dark chocolate, this category includes chocolate that has 60 to 72% cocoa – it has a pronounced taste and it melts into a thicker mass which makes it perfect for chocolate decorations since it is easier to temper and work with. Milk chocolate – 30-45% cocoa content – it is extremely mild and the taste of caramelized milk is the one that stands out. I recommend this one for mousses and creams, but not for sponges or other baked goods. Look for a high quality milk chocolate that has a high content of cocoa solids and keep in mind that is has a milder taste when using it in recipes. White chocolate – since it doesn’t contain cocoa solids at all, white chocolate can hardly be called chocolate. But even so, it is a great compound and has many baking uses, from cakes to cupcakes and decorations. It is quite sensitive to heat and burns easily, it is sweet and its taste is quite milky. A good quality chocolate doesn’t have any vegetable fat added and it has a mild taste. When it comes to white chocolate you truly need to taste and find one that fits your needs better. Unsweetened chocolate – this is chocolate in its purest form (100% cocoa). It is chocolate made from cocoa liquor and it has a dark, deep, strong, bitter taste. Obviously, it is not meant to be eaten simple, but it tastes great in baked goods – cakes, mousses, creams – as long as you use it in small quantities. Cocoa powder – there are two main types of cocoa powder: the Dutch processed one and the natural one. I recommend using the Dutch processed one as its acidity has been neutralized and it yields darker baked goods with an intense, yet balanced taste. 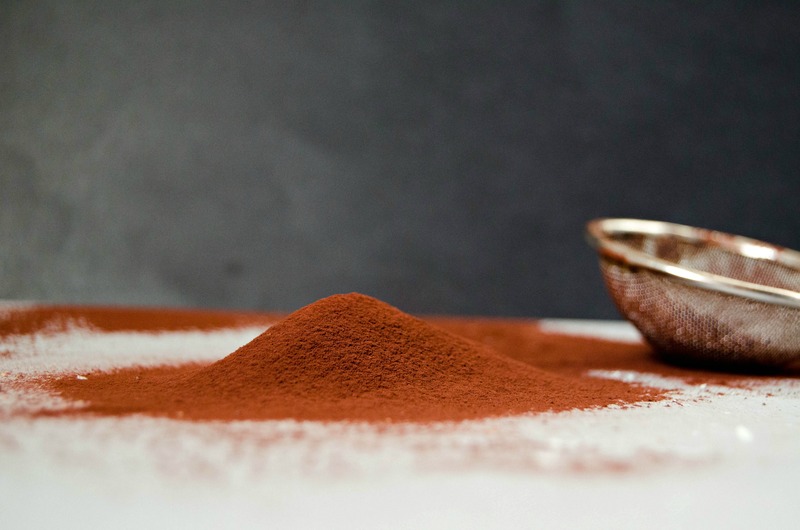 Natural cocoa powder has a milder color, but a more intense aroma. In the end they would both be a good fit for a cake so it’s once again a matter of personal preference. A baked goodie using chocolate often starts with the most basic of all chocolate processes – melting it. But as simple as that sounds, many things need to be taken into consideration when melting chocolate. Who would want a grainy, coarse chocolate?! No one! Melted chocolate gone all wrong is not a pretty sight for a pastry chef, that’s for sure! When melting chocolate keep in mind one thing: water and heat are chocolate’s greatest enemies! Melting chocolate can be done either over a hot water bath or in the microwave, but in both cases a single drop of water or too high heat can ruin your chocolate. So when melting chocolate make sure the bowl you put it in is clean and completely dry then melt it gradually until it is smooth and creamy. Too much heat could burn the chocolate so this process has to be done slowly over tempered heat. To melt chocolate over a hot water bath, place a saucepan over medium flame and pour in 1 cup of water. Bring it to a boil. In the meantime, chop your chocolate and place it in a clean, dry heatproof bowl. Place the bowl over the boiling water making sure that the bottom of the bowl doesn’t touch the hot water. Reduce or even turn off the heat under the saucepan. Using a dry spoon or spatula, begin mixing in the bowl until the chocolate is melted and smooth. Remove the bowl from steams immediately once the chocolate has melted and use it as needed. To melt chocolate in the microwave, place the chocolate in a heatproof bowl. Place the bowl in the microwave 20 seconds at a time, mixing well with a dry spoon after each time. This process might take around 1-2 minutes, depending on how much chocolate you’re melting at a time. Melted chocolate should look smooth and glossy. If it’s grainy or separated, water might have got in or you might have burnt it. Another possible cause of ending up with seized up chocolate is a bad quality chocolate. Certain types of chocolate have vegetable fat added and that can cause problems when melting it. To reduce the risks, buy a good quality chocolate bar and consider the tips mentioned above. Feel free to comment or contact me on Facebook, Twitter or Pinterest! Ai vreo recomandare legata de o anume marca de ciocolata? Sunt o mare amatoare de ciocolata; folosesc mult acest ingredient minunat in deserturile pe care le fac. Ai putea sa ne spui care este ciocolata pe care o folosesti in creatiile tale?